Daniel Cormier will attempt his first defense of the UFC heavyweight title against hulking knockout artist Derrick Lewis at UFC 230 on November 3. That’s thanks to some last-minute scrambling from the UFC brass, who had been struggling to create a fan-friendly main event for the card for weeks. While fans seem to be pretty excited about this undeniably surprising Daniel Cormier vs. Derrick Lewis fight, former UFC heavyweight champion Stipe Miocic is not. Ever since he surrendered the heavyweight title to Cormier in July, he’s been adamant that he deserves a rematch on the basis of his record-breaking three-straight title defenses. He even would have accepted that rematch with Cormier on short notice at UFC 230, he says. Miocic didn’t seem satisfied by this guarantee. In his eyes, Cormier should have accepted a fight with him at UFC 230 — not Lewis. 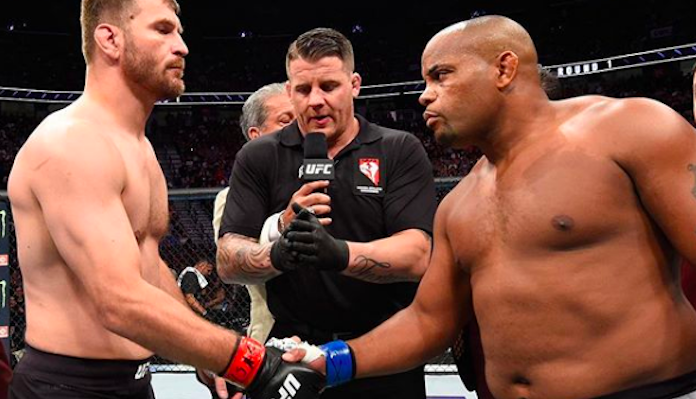 With Daniel Cormier still planning to retire in March, do you think we’ll ever see him and Stipe Miocic fight again? Join the conversation in the comments section below.